An extraordinary picture from NASA's Juno spacecraft shows that Jupiter has massive storms at its poles. 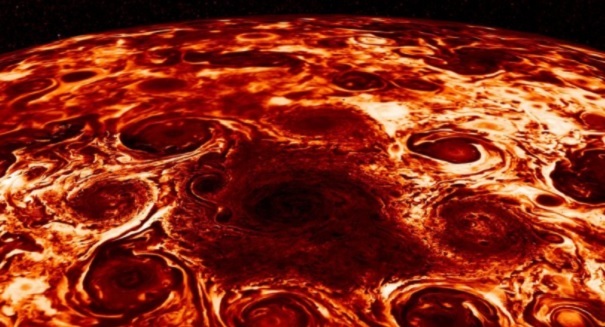 NASA’s Juno spacecraft, currently orbiting Jupiter, never ceases to amaze with its constant new revelations and photos of the incredible gas giant that is the largest planet in our solar system. And the latest photo, which you can see above, shows massive cyclones at the poles of the planet in detail never seen before. NASA says this is a mind blowing demonstration of just how bizarre and “unearthly” Jupiter’s jet streams are. But the images are more than just eye-popping, they also tell scientists a lot about the atmospheric makeup of this turbulent giant. And Juno also provided new data that shows the strong winds on the planet go deep down into the atmosphere and last far longer than anything we would see on our own planet. Scott Bolton, NASA’s principal investigator of Juno, called the new data “astonishing” and “paradigm-shifting.” He said that while Juno is just a third of the way through its primary mission, we have already seen some incredible new images of the gas giant from Jupiter and made some significant breakthroughs in our understanding of not just our solar system, but of the formation of planets in general.